Unique experience of trekking on the frozen Zanskar River. 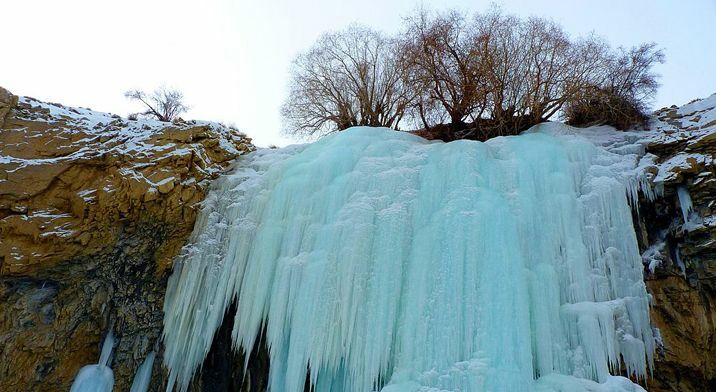 Amazing scenery, wild gorges and frozen waterfalls. It is an adventure-seeker's paradise. Countryside trekking hospitality at its best. Day 1: Fly to Leh. Day 3: In Leh (Get Medical, Insurance, Wildlife Permit and ALTOA NOC). Day 4: Drive to Shingra Koma. Day 5: Shingra Koma to Tibb Cave. Day 6: Tibb cave to Naerak camp. Day 7: Naerak to Tibb Cave. Day 8: Tibb Cave to Shingra Koma and drive back to Leh. The snow-clad from Himalaya which is in the form of the frozen lake called Chadar trek. Chadar means bail of ice, Ice flex use to change in slush by cutting into pieces. Heavily snowfall cutting villages all from one another for a month at a time. Zanskar River is a winter trail located eastern zone of Ladakh in Jammu and Kashmir. 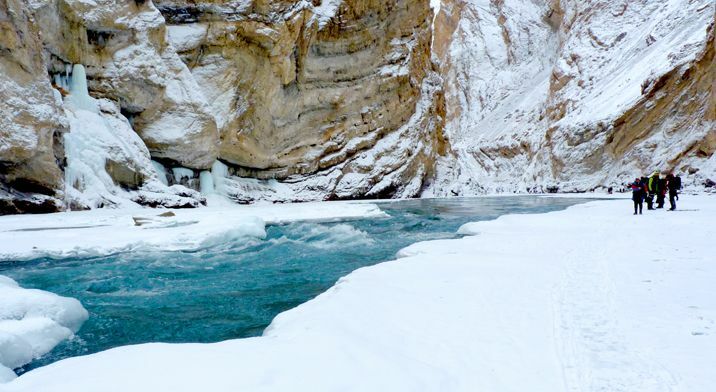 It’s a frozen river which connects Zanskar valley to Ladakh, it takes the place on the trade route that has been used by indigenous people for centuries. It’s one of the thrilled and adventurous treks in India. 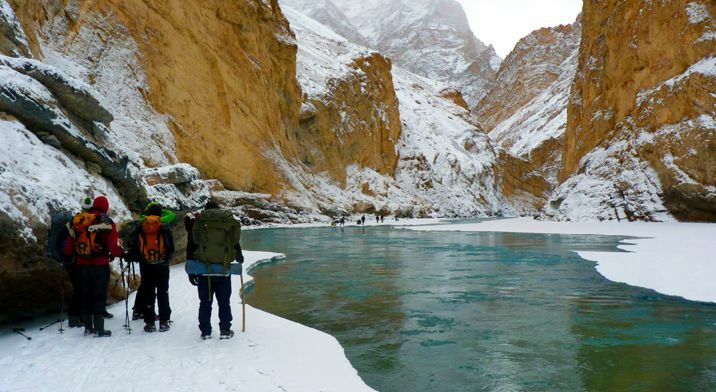 The Chadar trek is basically performed on a frozen river called Zanskar which means Zanks (Copper) & skar states for the Valley, it means valley of copper. During the summer it did not disappoint enthusiastic tourist for river rafting & beautiful view for photography. The thrilling walk on the frozen River makes challenging for trekkers. 30-35 degree Celsius can increase the trouble for trekkers but an average trekker can cover 15-18 km in a day out of 105 km trek. Day 1 : Fly to Leh. Keep your woollen cap and gloves handy. Landing in Leh at the 22nd highest commercial airport in the world which is “Kushok Bakula Rimpochee” airport; The airport is named after 19th Kushok Bakula Rinpoche, an Indian statesman and monk, whose Spituk Monastery is in direct vicinity to the airfield. Where our guide will pick you up from the airport and you will be heading to guesthouse, throughout the way you will get the idea about the lethal temperature with push back air flow; after reaching to the guest house you can freshen up yourself and can get all the essential equipments and cloths for trekking. There is a market called “Old Tibetan refugee market” which can help you to make your mood relax, and after all over the market session; you will get back to the guest house before the sun goes down as per our safety norms. All the health-related issues that trekkers can face, as per the new regulations applied by Ladakh Government Authorities, this acclimatization is giving to the trekkers so that anyone doing the Chadar Trek should be at least spend one day in Leh to get their body used to of the weather conditions here, every trekker strictly follows that. You can spend the day shopping at the Leh market. It is essential that you get used to the cold temperature in Leh because the frosty weather will only tend to fall as you start walking on the frozen Zanskar. Basically, it’s a day where we provide expertise guide along with local people to give you a brief about the trek. At least you’ll get mentally as well as physically prepare for every situation; even though we provide medical check-up to make sure whether you are fit for the trek or not. You can do some exercises which help you to get fit for the trek. Sightseeing would be a good idea to get habitual with temperature but only in the daytime, you need to come back to Gust house before sunset. Alcohol and smoking are prohibited during a trek along with camp and guest house area as per our safety norms. Altitude: 10,390 to 10,550 ft. The day will start with some challenging steps like to get out of your comfortable and cozy shelter but you have come so far where Cristal white Chadar will be waiting for you to take away on it, mind your steps on snow bail roads because you will not be familiar as much as localities are. You’ll drive till Nimu where Indus & Zanskar meets, military sub area with some Bourg houses shut down the cause of weather. This day will cover 10 km at least; while walking on the side of Chadar and glimpses of slush appear to keep drift away with the flow. After an hour you’ll be in Tilat Sumdo; this will be the very 1st place where you can see Tibetan tribes people. Singra Koma is 9.5 km from this place; an average trekker takes 6 hours to reach. After a bit, you’ll get used to of walking on Chadar, it’s like a nature treating you with skating adventure. Camp food after fatigue day will make your mood on; at the parabola edge exactly bang on the river Gyalpo is located. It seems handmade white frost spread around; humongous trail will make you feel safe and protected. After night meal retains your only liveliness in trek and inverts from stockpile for next day. Altitude: 10,550 to 10,760 ft. Applause yourself for the next day with a bed tea in the early morning, after having breakfast we’ll move towards Tibb cave. Eat well it gives you the energy to walk; even though walk makes your body warmer than meals but still for safety purposes, as well as for this day because the day will be the harder than the previous one and here you walk around 15 K.M. at least. Through gulches of Zanskar will seem more beautiful and adventurous. While walking on the way tunnels will be visible, it seems rock solid with ice pelted. In mid-way, frozen waterfall reminds you-you're all Disney cartoons from childhood because the waterfall will be big from one another. Crossing up the frozen waterfall, you cannot miss the chance to show your photography talent here and it will compliment your talent perfectly. Tibb cave is a gift from Zanskar valley to Tibetan carriers. Butter tea, also known as Po cha will surprise you with the texture of teapot; it will help your healing chapped lips. Altitude: 10,760 to 11,150 ft.
Yesterday’s curiosity will be there about frozen waterfall because the big one is about to come. It’s a perfect example of witchcraft of nature where several colors are spreading all around; it’s more like a piece of glass made by nature I would rather say. Getting after the source of energy through the day meal you can say, the Skycaps Mountains seems to be struggling with the sunlight. The only thing which connects the river to the valley is the bridge which you can see only in summers. Outstretch tent will prepare night meal for you till then if you want to get colored into Zanskari life you can. You’ll forget your 12.5 km journey in just a few moments. Altitude: 11,150 to 10,760 ft. The day is about going back to Tibb Cave, but this is not too easy to do. Cause temperature will surprise you all the time till morning to sunset. On the way you’ll get the glimpses of nostalgic memory where u had struggle to reach there and some clicks on your mind, the local people fresh up your memory more when they come back from Leh to their villages. Kind of positive and to be a happy kind of attitude will make you feel if they can why don’t you. Name of some Zanskari lifestyle fatter getting yesterday’s session; you’ll automatically speak like Goucha (Woolen robe) and colorful sash Schrage. Altitude: 10,760 to 10,550 ft.
From the home of Tibetan, carriers will be a bit nostalgic. The day will start towards Shingra Koma, the humongous trail with white coated Gyalpo seems to be reachable after an hour, but it’s not. Because we have to cover around 15 km or more than that as you already saw and got the idea about Gyalpo it’s a summit of the enormous mound, so it will be such a great thing to be the part of an indelible moment. Some descry feeling can get you some Himalayan animals. After departing from Leh this journey will remind you always be the part of the land beyond the world but located in J&K. The people are behind the wall of snow, Brave Zanskaien I must say, that innocent smile overlaps your smile when you ever think about your Chadar trek experience. Respect comes from the heart for the people from Ladakh valley to be so Patriotic for their land. Linguistically they are different but they are more prominence than anyone because nature blesses them well. Trekking on Chadar, no doubt, is one of the most thrilling adventure one could ever have in his/her life. With an elegance of nature and unmatchable experience of the pristine mountain ranges, trekking stands out among all the adventures across the world, but nothing comes free, there are certain aspects of the trekking which one needs to consider while he/she is making up his/her mind for trekking. Here’s a list of some basic requirements which one would need during his/her camp trekking. Let’s pay some heed to these requirements for trekking. Three warm layers: On high altitude treks Chadar, temperature after the sunset drops to the considerable degrees. So, during these campsites, you might need an additional layer along with the padded jacket coupled up with a fleece and a warmer. Sun cap: The sun feels brighter and nearer at high altitude treks like Chadar. Used sun caps to save your neck and face from sun Burns, Especially if you are trekking at the end of the day. Toiletries: Be wise while choosing your cosmetic needs and daily use products. Refrain from using the non-biodegradable products, if you do so then make sure that you leave residue on the mountains. Always carry a zip bag to put such a piece of stuff after use. Sanitary napkins also need to be treated in the same manner. Trekking on Chadar is a different kind of adventure where you required to be physically and mentally prepared for the best and worse, at the same time. While high altitudes treks making it tough to breathe, the beauty of those pristine mountains leaves you speechless so that you forget to breathe for a moment or two. In addition to the physical and mental preparation, there is a certain aspect of the health that is needed to be considered on the first hand when you make up your mind about the trekking at Chadar. Trekking at Chadar demands endurance and fitness and those who suffer any kind of physical or physiological ailments are advised not to go for high altitude treks in the beginning. To get assurance about the trekker’s fitness, we comply with certain aspects of the being fit such as BMI (Body Mass Index) along with the fitness proof since we can’t put the trekkers into the risk. Monitoring the health is one thing that is conducted regularly during the Chadar trek by the trek leaders which includes the monitoring of your blood pressure, oxygen level and pulse rate. Details of your health during the trek is maintained in the health card on the regular basis. Health card can be collected from the trek leader at the end of the trek. 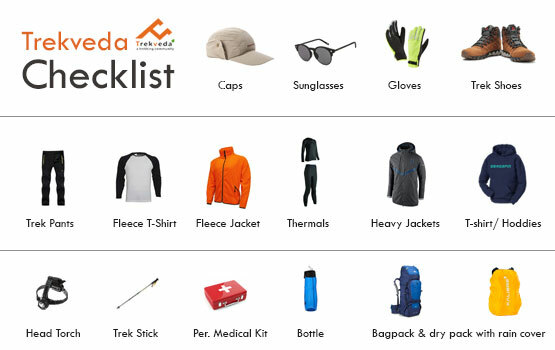 Trekveda provides you all the necessary equipment for trekking at Chadar from tents to ropes. In addition to that, our trek leaders also ensure the safety by various safeguards they take from time to time for your safety. Microspikes are provided to attach to your shoes which help you to keep the traction on the snow and make it easier to climb. An additional gaiter is provided to cover the snows which prevent the entering of snow into the shoes. 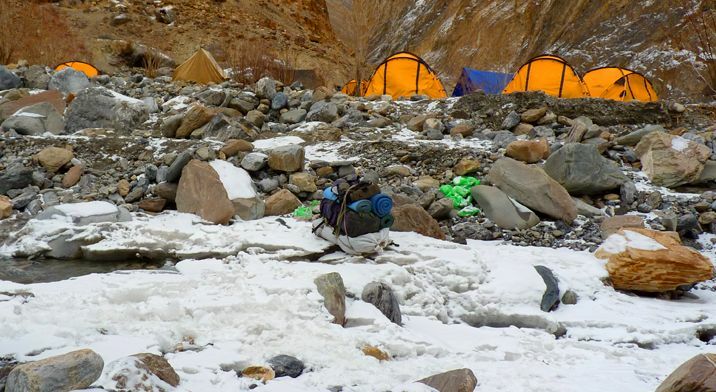 Customized tents are provided to the trekkers which ensure the warmth and temperature 10 degrees higher than the outside coupled up with high-quality sleeping bags which can endure the temperature up to 15 degree Celsius below the freezing point. Trekveda, keep all your nutritional and hydration requirements on its checklist, our trek leaders will guide you to keep your body hydrated on the high altitudes Chadar trek as de-hydration can attract to the severe medical emergencies while trekking. Problems like Acute Mountain Sickness can prove fatal at Chadar if not taken into consideration seriously on time. If you face any of the symptoms such as a persistent headache, fatigue or weakness, nausea, dizziness, loss of appetite, difficulty in sleeping, you shouldn’t let it go or treat it by your own either just inform your trek leader. Chadar is difficult trek which is suitable for experience trekkers. You need to have at least 2 months physical and mental conditioning. Trekking at Chadar, for its ever-lasting memories and experience, demands just a few things which involve physical endurance with physiological wellness. Not just the one who’s physically fit would do the magic in trekking but one also needs to be mentally fit as well in order to cope up with the adversities one might have to face during the treks such natural calamities, rains or other unforeseen conditions. Getting to the Chadar trek without proper preparation is something you should never do. Cardiovascular exercise is one of the most sought-after methods which provides not just the physical endurance but also the strength to withstand any unavoidable circumstances sternly. Trekking at Chadar demands the high endurance which you can develop in a month or two where you need to begin with the jogging or running (only if you could do). This practice needs to be combined with the speed and distance targets. You need to keep on increasing both with the time. Another vital area of improvement, you need to work upon. Before you head to the Chadar trek, you need to have the physical strength in order to carry backpacks on the uneven terrains. Considering everything under the sun, you ought to prepare yourself for the core strength. A strength would be making you suffer less than others who don’t prepare before it. To pacify yourself or any other companion, yoga and meditation are the keys. These practices not only give you the mental peace but also provide you with a placid inner conscience which is extremely important in order to withstand the cons during the Chadar trek. The trek expense of Rs. 17,500 + 5% GST takes care of all expenses of the trek from Leh to Leh. Meals – All meals from to breakfast till last day of the trek are included. We provide simple, nutritious vegetarian food on all days of the trek. Note – You need to bear the cost of food on first day our Leh Guest house. Transportation – Cab charges from Leh airport to guest house is included. Trekking Equipment – You will stay in high quality tents and sleeping bags in all the camps. Our high-altitude sleeping bags can withstand temperatures as low as -10ºC. We provide ice axes, roped, micro spikes, gaiters etc. as required. Food during the stay at guest house while first and last day of trek. Backpack offloading charges - If you wish to offload your backpack, there will be an additional charge of approx. Rs. 2,000 + 5% GST. The backpack cannot weigh more than 9 kgs. Suitcases/strollers/duffel bags will not be allowed. Please note that charges will vary for last minute offloading in case you decide to offload your bag after reaching the basecamp (Rs.400 per day inclusive of tax). Online offloading in advance is possible up to two days prior to the trek start date. Buffer day – It is mandatory to have this extra day as any bad weather or rain will delay your pass crossing. If buffer day is utilized, you will need to pay Rs. 2,100 + 5% GST. This amount is to be handed over to your trek leader. Or if you wish to call off the trek voluntarily at the last moment, in this case 3the mail requests at cancel@trekveda.comor contact at +91 7078701964 will be entertained. The cancelation policy will be same whether you are canceling your trek just after booking the trek. What is the average chadar temperature is? One of the important think you need to know before doing Chadar trek is its temperature. In the daytime, the temperature remains from to zero to -5 and in the night it can go down to -25. So it’s usually freezing cold there throughout the year. Hence in order to get yourself not bothered with the temperature all you need is to keep yourself tuned up with the changing temperate. However our trek leaders are the trained professionals who would let you know about the precautions, but packing woolen cloth accordingly is your responsibility. Why is it called Chadar trek? The River Zanskar froze in winter, which create a sheet of ice over the river: Hence the name chadar. Why Chadar trek is famous? The Below freezing point temperature and extreme weather condition are great attraction toward adventurous trekkers. But, you need proper preparation before going on this trek, as difficult trek are more adventurous but without carrying require things will result in a nightmare. What is the height of Chadar? The Chadar height is what varies with every phase you pass as your approach the Chadar trek, you will acclaim a height of around 14,450 ft. near Zanskar Lake. 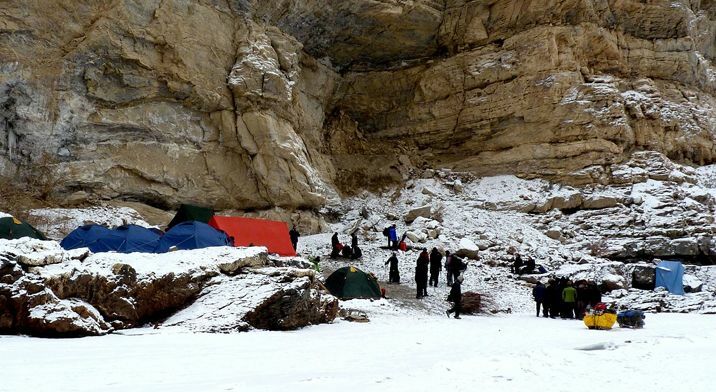 What will be the base camp of Chadar trek? Trekveda makes its basecamp at Leh. This is one of the most beautiful places that leads to you to the pristine snow-clad areas while letting your relish the vibrancy of nature at large. Leh will lead you to the majestic heights of Chadar which will mesmerize an ecstatic experience of walking on the Frozen Lake. How do we reach Leh? Our basecamp would be at Leh where you can reach via a flight from Delhi, then take a cab from airtport to guest house in Leh However, planning a trip as per the comfort would make your trek easier and you’d not be exhausted before the real thrill. Your accommodation at Leh in the beginning and the end at the guest houses where you’d be sharing the rooms with the fellow Trekkers. The stay on the other days will be in the tents which will be provided by the Trekveda. Each tent will be shared by three fellow trekkers however special arrangements can be made on request. A separate tent will be assigned as the toilet room at each campsite. Any additional baggage (without valuables) can be left behind at the Leh. The best season to see the snow on Chadar trek is the January and February where you can see a lot of snow-clad you can also witness the fresh snowfall at heights if the climate is favorable but if you’re planning to see the snow at large then the Last week of January and first week of February is best. Mobile network on this trek will be until Basecamp which is Leh. After that, there is no network coverage. The distance of each day would vary as per the campsite location, however, there’s a rough figure of 8-15 Km you need to cover each day during the trek. Chadar trek is considered as difficult trek which can be done by the experienced trekkers only. The sloppy ice treks on chadar trek make it difficult to walk. You can’t risk taking the preparation for physical strength prior to trek for granted as it may cost you losing your best trek experience. Yes, Trekking shoes is must for this trek.The trekking shoes give you the needful grip while climbing or crossing the water streams. However on the snow, we would provide you with detachable spikes which will help you to stiffen your grip on the icy slopes during the trek. You need to return these micro spikes attached to your shoes to the trek leaders at the end of the trek at the basecamp or prior to that. Yes, of course, we have an acclimatization day on this trek and that would be at Leh where you will be calibrating your bodies by spending time in the nearby locations such as local markets or woods in the vicinity. This will help you to pace up with the climate at the high altitude and thus protect you from any fatal consequences during the take that might happen due to the climate change. A better adaptive body will have the most amazing experience at the trek. Can I take my child along on this trek? Only the Experience trekker is consider for this trek. No, this trek required proper fitness and trekking experience will be beneficial. First time trekker will face problems in this trek. But you can get trekking Shoes and other equipment on rent directly from the marking in Leh. Returning to the home with the mystical memories would probably be the best feeling after the trek. Your Trek will end at Leh in our guest house, to return you can take a cab to airport to fly to your respective cities. What will be the total expense for a Chadar trek? The total expenses of the trek will be 18900 INR per person. In addition to that an additional of 5% of the GST will be levied on the total cost. Cab Charges from Leh airport to Guest house. Stay in Guest house at Leh. Stay and food cost during trek. Transportation Charges - Flight and cab charges between to and from basecamp. Food in Leh – You have to bear the cost of food while staying at Guest house in Leh. All other expenses while travelling. Chadar is not meant for Mass Tourism. It is fragile and precious. Chadar has limited carrying capacity and mass tourist treks cannot be operated as it is a threat to the flora, fauna, and ecology at large. In recent cases of casualty at Chadar, the District Administration and ALTOA decided safety measures- such as Medical Check-up, Insurance, and Medical Rescue Centre. We will have single window clearance system at the TIC, Leh (Tourist Information Centre) opposite J&K Bank, Leh. Medical Insurance is mandatory for all trekkers, foreign and domestic. Pre-medical check up will also be mandatory for all the trekkers before the trek. Mandatory 3 nights stay in Leh on Arrival for Rest and Acclimatisation. Day 3 Get Medical, Insurance, Wildlife Permit and ALTOA NOC. Persons found Medically unfit will not be issued Clearance. Anyone found in violation of these rules will attract strict measures from the District Administration. Wildlife Department permit @ Rs. 2,200/- for Foreigners. Wildlife Department permit @ Rs. 2,000/- for Indians. NO fee will be levied for Guides/ Cooks / Porter - Wildlife Dept issued a circular in this regard. ALTOA will provide Adventure Insurance and Medical Check-up at Leh @ Rs. 3,000/- PP. Note: We are trying that trek will cover in the same 9 days but please be ready for any changes in itinerary of Chadar trek after these important update from District Administration and ALTOA. We will update the itinerary if any changes will be done. Click Page 1 and Page 2 to see District Administration and ALTOA Order.